The question is one of chaining together pieces of the problem. What IS Eck industries 2010 award link to Washington Monument. There IS one?? Sure enough, it's the Washington Monument. I read a bit about the monument in preparation for figuring out the next bit. 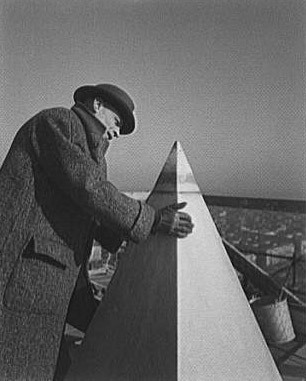 (This included the surprising observation that Robert Mills, the architect of the Washington Monument ALSO designed the very first Washington Monument in the US... This one is in Baltimore. Go look it up yourself. Who knew?) In the process I learned where the stone for the monument came from, when it was designed and funny/odd details such as that the topmost tip of the monument is made of aluminum. Really? I'll spare you the details of how I figured out it was Eck Industries. It wasn't that interesting a process--just a lot of slogging through companies in WI that won awards and looking for a possible connection to monuments in DC. I finally ran across one that won an award for metallurgy in aluminum (Eck Industries--aha!) and the rest was pretty straightfoward. Click first hit, (the Wikipedia article) and find that William Frishmunt, like Phillip Eck, ran a casting foundry. What's more, his foundry was the first to cast aluminum AND that's the material used on the cap of the Washington Monument AND his foundry was the place that cast it! So the connection is this: Eck won the Firshmuth award in 2010 for superior aluminum metal casting, which is what William Frishmuth did for the Washington Monument. Wednesday Search Challenge (March 30, 2011): What's the connection? Another friend gave me this amusing puzzle today. Apparently there is a company based in Wisconsin that won an award in 2010 that has some connection to the tallest monument located in Washington DC! This one stumped me for a while, so I'll give you a little hint to speed you on your way to solving this particular problem: the Wisconsin company is named Eck Industries. Can you figure out the connection between the award Eck Industries won in 2010 and the tallest DC monument? A friend attended the most recent TED conference and came back with an exciting comment about doodling ("People who doodle can retain nearly 30% more information than those who don't!"). Being a skeptical kind of guy and knowing a bit about the psychology of multitasking, I looked up the original reference for a little background and found out that's not quite right. I chose these words carefully. I included "retention" because of the use of the word "retain" in the original post. I included "doodling" for the same reason. I was hopeful that this would work, but not positive. They might have called it "sketching" or "scribbling" or something else. But I gave this a shot and... Voilà! As with many such cog-psych results, you have to be a little careful in the interpretation of the study. The "doodling" task was just shading in areas on a pre-printed page (that's VERY low cognitive overhead, in particular, it's less demanding than even normal doodling). In the study, the primary task (listening for names) was VERY simple, and the "recall" of information was really just noting names as they were mentioned in real-time. The primary task was also designed to be boring, so people who didn't have the doodling secondary task suffered from vigilance problems. In particular, as Andrade's paper says, "their doodling would not have the spontaneous, automatic quality of naturalistic doodling." The participants were doing "name spotting" (that is, listening for names of people) and NOT doing any memory task but rather, a recognition task. So it's far from a ringing endorsement of normal doodling as a constructive/focusing secondary task! When checking on the credibility / authority of such a comment, you don't always get quite as lucky as I did with this search. But it's well worth doing. Check your sources, you never know quite what you'll learn in the process! Here's the original paper that was being slightly misquoted. Title: What does doodling do? Doodling is a way of passing the time when bored by a lecture or telephone call. Does it improve or hinder attention to the primary task? To answer this question, 40 participants monitored a monotonous mock telephone message for the names of people coming to a party. Half of the group was randomly assigned to a doodling’ condition where they shaded printed shapes while listening to the telephone call. The doodling group performed better on the monitoring task and recalled 29% more information on a surprise memory test. Unlike many dual task situations, doodling while working can be beneﬁcial. Future research could test whether doodling aids cognitive performance by reducing daydreaming. Answer: Winged heart? Search for the category! I'm going to have to up my game! Three folks solved this one quickly and with a certain amount of search aplomb, which is nice. Fred tried the obvious searches of [winged heart symbol] [religious heart wings] and found that the Sufi Movement symbol http://www.sufimovement.org/mes_symb.htm was close but not exactly the symbol. EMLD and David both did the same thing, quickly moving from a description of the thing [ winged heart symbol ] to the general category. In my case, I did [ tombstone veteran symbol ], which also led me to that same VA page with the answer: Sufism Reoriented. Wednesday Search Challenge (March 23, 2011): Winged heart? I was curious about it (as I am about most things) and couldn't wait until I could look it up to figure this out. 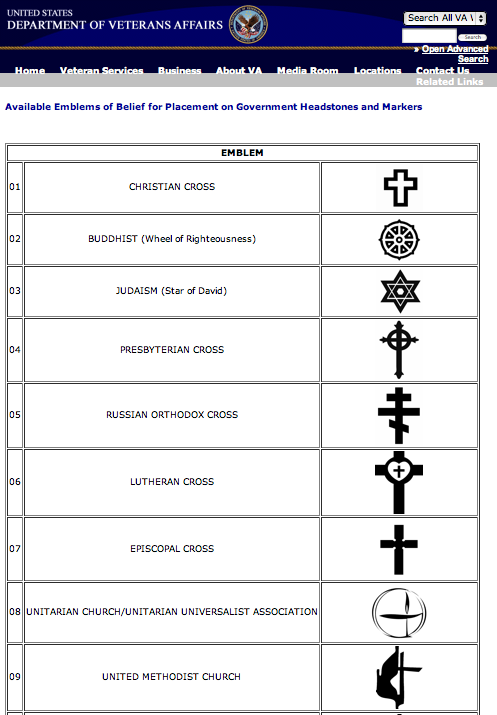 It's clearly a religious symbol of some kind (nearby were markers with crosses, stars of David, eastern Christian crosses, and even the occasional wheel of Buddhism. But this one baffled me. I figured it out in about 1 minute. How long will it take you? What religion does this symbol denote? That wasn't quite enough. I then clicked on the videos tab in the left hand panel in order to search over ALL of the videos that Google has indexed (and not just the ones on YouTube). BUT the link was dead. Drat it all. All was not lost, however. I gleaned one piece of information from that snippet… it suggested I should add the term “Ukraine” to my search. The first result for this search is exactly the same as the original video my friend shared with me. This video suggests that the building in question is the Kharkiv Regional Administration building in Kharkov, Ukraine. A bit more digging reveals that this artistic projection was done in honor of the city and for Independence Day in Ukraine. Search lesson: You can pick up clues along the way. This would have been a difficult search except that I discovered the hint that it was in the Ukraine from that one dead link. Once I added that term to the search, everything else fell into place. What counts as a credible source for a newspaper article? There's been a recent kerfuffle in the NYTimes about what counts as a credible resource for news reporting. To start, there was an article in the Times about how Michelle Obama is advocating breastfeeding. The problem begins with the article containing with a few quotes from “anonymous bloggers." Arthur Brisbane, the public editor for the Times and the “reader’s representative” who responds to complains and comments, wrote in commentary. The Times’s policy on anonymous sourcing describes the use of anonymous sources as a “last resort to obtain information that we believe to be newsworthy and reliable.” The policy goes on to say that the identity of every anonymous source should be known by at least one editor. Unfortunately, it is all but impossible to know the identity of an anonymous blogger. “…her reporting included interviews, as well as the blog material, and that interviewees were reluctant to be quoted. The blog material supported what she was hearing in her interviews, she said. “I wouldn’t have taken only blog postings, but given that they backed up what I was hearing elsewhere – and that this was generating so much comment online – they seemed to be relevant,” she said. So… Should you use anonymous blog posts in news coverage? I would say generally no, there’s really not any value added to the conversation. The point of reporting is to add some information or insight to the public conversation. If the blog quotes were brilliant, incisive bits of text that added a perspective or nuanced and colorful language, it might be a plausible addition. But the quotes are pedestrian. They fell like filler more than content. When you’re trying to make sense of a complex argument or data-space, your task is to gather insightful, dataful and useful content. Anonymous bloggers do not a source of data make. But one unknown blogger with an opinion is pretty cheap, content free stuff. The NY Times really shouldn’t be reaching that low for their sources. Answer: What kind of feather is that? and very quickly discover this is the newest fashion trend in hair decoration! (I didn’t know that.) Even Steven Tyler is wearing feather hair extensions, so it must be pretty popular in Hollywood and fashion circles. and found that the word "coque" means: n. 1. A small loop or bow of ribbon used in making hats, boas, etc. Ah. So "coque" is a jargon word that refers to this kind of thing. 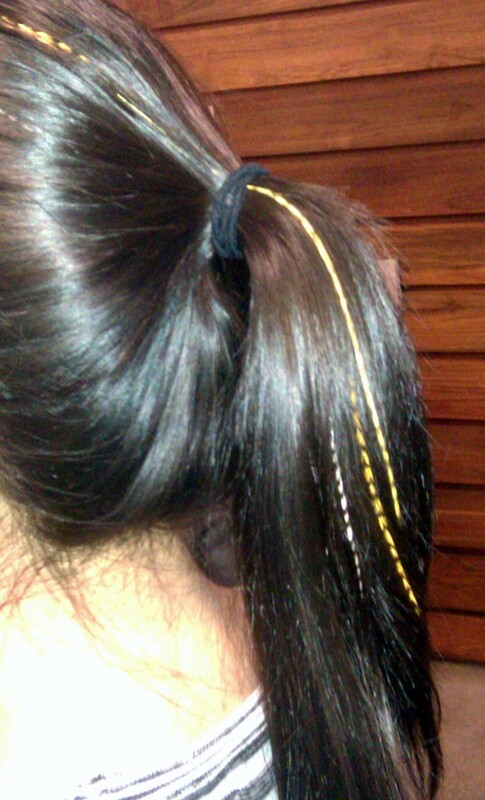 Hence, "...coque, feathers..."
This led me to Etsy's page on yellow-black-feather-hair-extensions. This page says it’s “rooster feathers" somewhere in the middle. So far, so good. But I really wanted confirmation of this. So I kept searching for another source. Farther down on the same results page I see "Hairfeather site” with the phrase “top of the line rooster feathers” in the snippet. That seems promising, so I click through to lowlight-hair-feathers. Turns out that the Featherplace also sells feather in bulk for Mardi Gras and costume decorations as well. 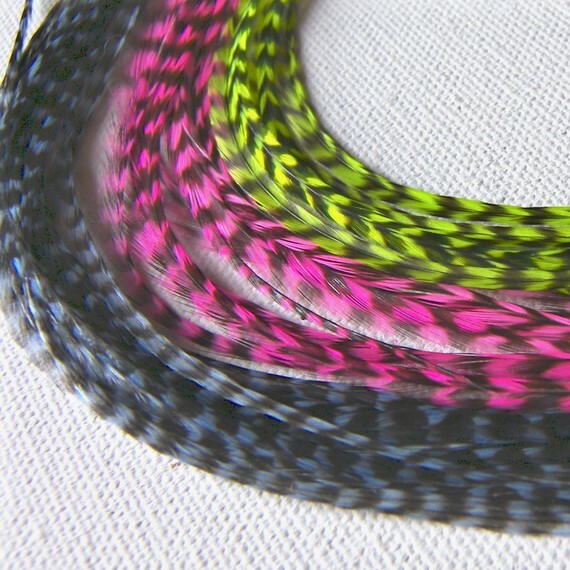 Who knew there were feather wholesalers? Makes sense once you read about it, but this is the magic of internet search. You end up learning all kinds of things you'd never expect. Hair extensions, coque, feather wholesalers. The world is a remarkable place. Search lesson: In this case, I should have jumped immediately into searching for the "yellow black feather extension" since I wanted to know specifically what she was wearing. It didn't matter much in the end, but it would have saved a step or two. Wednesday Search Challenge (March 16, 2011): What kind of feather is that? I saw my friend Theresa earlier this week with the most extraordinary thing in her hair. I couldn't resist, so I asked "What is it?" She explained to me about hair extensions, and how humans can ALSO get feather extensions. Essentially, it's a long feather that clips onto a small clump of hair and then becomes part of your hair for as long as you'd like. Me, knowing nothing about hair extensions was astonished. "Really??" Yes, really. Turns out there's an entire industry of extensions about which I know nothing. What kind of feather is it? That is, what kind of bird did this come from? Can you figure it out? Some clues--it's about 12 inches long and maybe 1/4" wide. 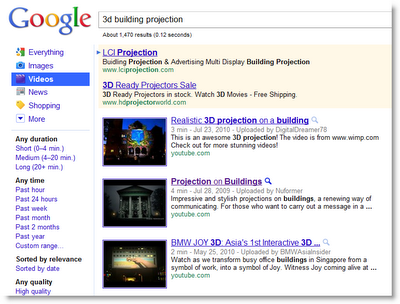 As you know, Google gives previews of the web pages shown in the SERP. You activate the preview just by clicking on the small magnifying glass icon (next to the star) in the result block. Or, truthfully, you can click anywhere in the result block. But Google just announced the ability to preview videos in place. Why would you want to do this? 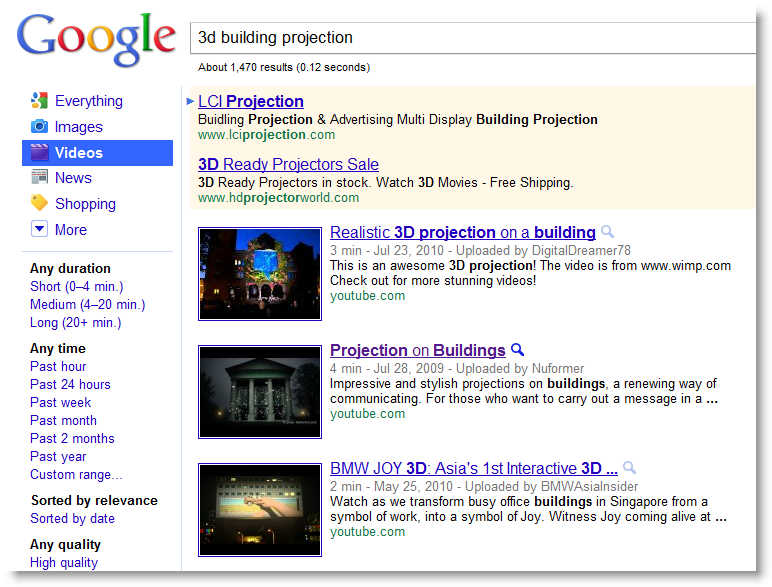 Answer: When there are lots of diverse videos in the SERP and you'd like to identify the right one quickly. When the results are pretty much all the same, it's easy:. 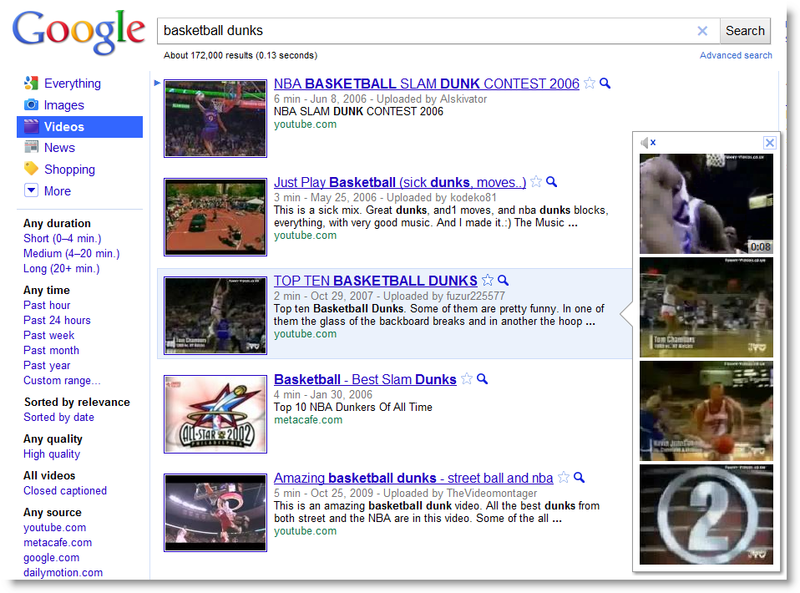 Example -- for the query [ basketball dunks ] you'll see there are lots of videos. Then, when your mouse is in the result block area, you'll get the pop-up showing the different segments of the video. This multiple clip preview usually lets you figure out quickly if this is the one you want or not. As you'll see, the video is actually live--you can fast forward by clicking in the next clip segment and jump right to that piece of the overall video. This is REALLY handy when the video results are more diverse, and you can't really tell them apart except by clicking though to the result. 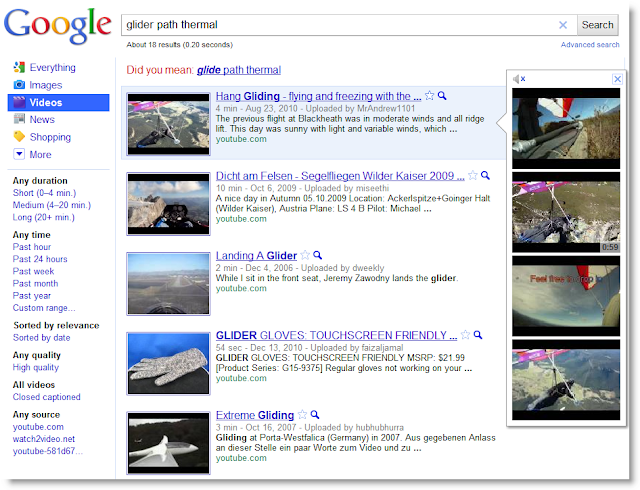 In the case of a query like [ glider path thermal ], you'll find videos about hang gliding, remote-control gliders, thermal gloves and full-size gliders. In a case like this, the video preview can save you a lot of time! Answer: Can birds sing more than one note at a time? The short, somewhat surprising answer is YES! There are many ways to solve this particular challenge. Here's how I figured it out. My first query: [ bird song two notes at once ] leads to a number of books and articles, many with tantalizing hints. I quickly learned that I had to tell the difference between simultaneous notes and rapid alternation between notes. Question is, how would I do this differently in my search? The first hit for this query was the Wikipedia article on Bird vocalization. Reading through that I learned that the syrinx is sound-producing organ in birds AND that there are two sides to the syrinx, both of which can be controlled independently. On the left is the external view, on the right is the cross-section. 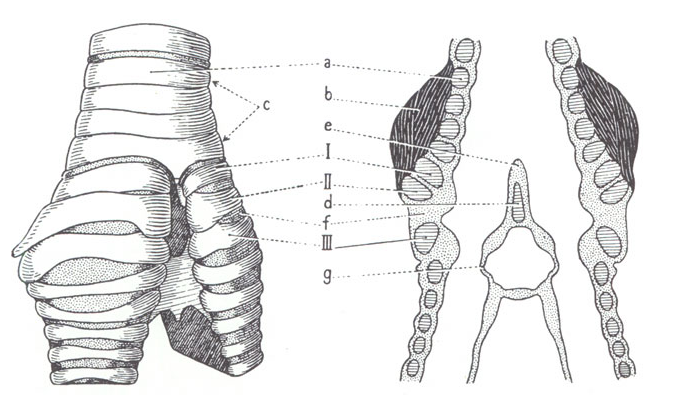 Unlike the human trachea, the two sides can be both used simultaneously to produce two notes at once. This led me to do the query: [ synrinx two notes ] for which the first hit is the Wikipedia entry Lateralization of bird songs. A fascinating story, the article points out how birds can use both synrixes to create different pitches by switching back and forth between the left and right syrnix (for example, the left creates a high-pitched tone, while the right produces a low-pitched tone). Or, they can switch back and forth very rapidly to create complex and rapid songs. But what about two notes at the same time? While reading the article, I found the link to the Wikipedia article on bird song which points out that several species CAN produce two tones at the same time! This discussion led me to do another query: [ bird syrinx two notes at once ] which led me to the outstanding discussion at Earbirding.com on bird song polyphony. (Why did I do [ bird syrinx...] ? Answer: to discriminate between "syrinx" as a performance piece for solo flute and the anatomy of birds! Interestingly, humans can sing more than one time at a time as well. We just can't use a syrinx to do it! See "overtone singing," or listen to it here. Search challenge (Mar 9, 2011): Can birds sing more than one note at a time? Great question, but not one we'll tackle today. But what I'm really interested in is much simpler mechanics... Can a single bird sing two notes at once? Rapid switching back and forth between two different notes is NOT the same thing. I'm curious if (and how) a bird could sing in harmony with itself! Sometimes you really need a specific KIND of image when searching. In particular, sometimes you want an image that can be scaled to an arbitrary size. SVGs -- Scalable Vector Graphics -- are images that descriptions about how to draw the basic elements needed to create an image. That is, rather than compressing an image into a JPG or PNG, an SVG represents elements like lines, circles, polygons and more complex shapes as commands. Unlike the images typically returned by most search engines (for example, JPG, GIF and PNG), SVGs can be stretched to any size without the quality of the image suffering. This makes SVGs ideally suited for diagrams that you're going to re-size to a much larger form (or much smaller). 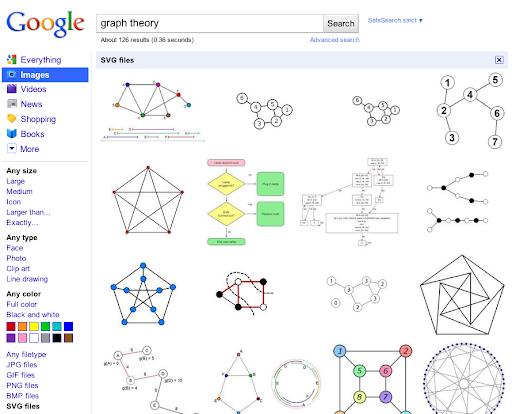 Think about looking for SVG when you need clip art, maps, logos, flags and scientific diagrams. You can search for SVG images by doing a filetype: search. If you want the easy way to do this, you can click “Images” in the left-hand panel, then click "Advanced Search” and then select the SVG filetype. Which then gives you lots of excellent options for downloading (and even editing, if you use a site like Clikr.com ). These SVGs can then be printed at an extremely large size without any degrading of the image quality. Answer: What islands are those? immediately leads you to the Wikipedia page for Channel Islands with a map that looks an awful lot like the one I posted. The islands are: Anacapa (the smallest), San Miguel, Santa Cruz, Santa Rosa, San Clemente, San Nicolas, Santa Barbara, and Santa Catalina. Once you know these the Channel Islands off the California coast (and not to be confused with the Channel islands in the UK! ), then it's pretty simple to just look down the Wikipedia page and find the area of each island, with Santa Cruz (at 250 square kilometers) beating out Santa Rosa (215) and Santa Catalina (at 194 km^2). As Michael suggested, looking for "Doctor's Cove" and verifying that the quotation (and the book) are correct is a very good move. Search lessons: To find a quotation, you sometimes have to go to the source directly. In this case, go to Google Books to search for a unique string (I used "amber and rusts take" -- I figured that was a REALLY unlikely sequence of words to put into the text of a book... I was right). Checking on Amazon is a good move, but since you can see that snippet directly in the scanned text of the book. 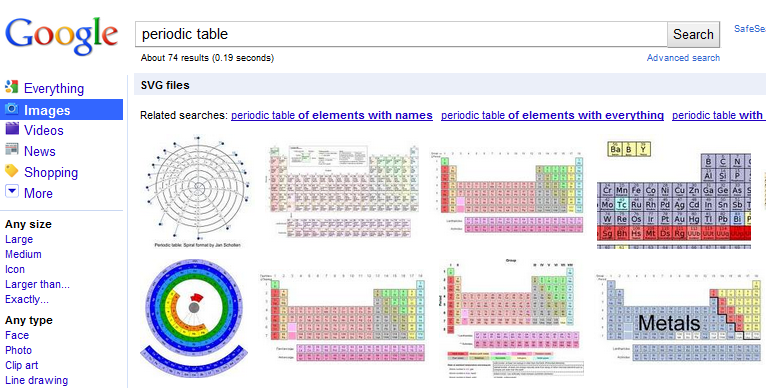 Oddly, this search [ "amber and rusts take" ] doesn't produce a useful hit on regular Google Web search. I'm not sure why... I'll check into it and see what's up. But a useful take-away is that extending your search into other search corpora (e.g., Books or Images) often will get you additional hits that are incredibly useful. 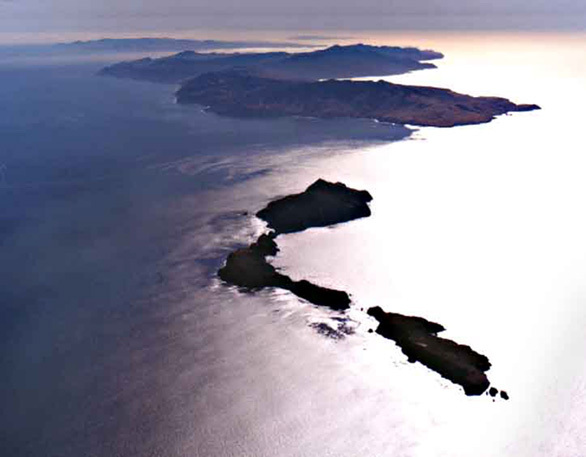 Northern Channel Islands with Anacapa in the foreground. Wednesday Search Challenge (Mar 2, 2011): What islands are these? How big are they? I grew up in Los Angeles, California, where there are a set of magical islands just offshore. One of them has a real city on it, while the others are nature preserves or quietly reseting in the sun. One is a Naval bombing range (perhaps not quietly resting), and another is the epitome of a desert isle. Today's Search Challenge isn't too hard (we have to mix it up a bit), but more fun that difficult! What is the name of each island? Which of them is the largest (in area)? For extra credit, this passage is from a book about one of those islands. What book is this passage from, and which island is it about? "I watch the island grow and acquire dimension as the sun rises; the ambers and rusts take on a glow when the first light strikes its highest peaks. I've witnessed this same scene many times, waiting on a boat for enough sun to make out fish shapes in the early underwater light. The memory rekindles that excitement and my unanswerable doubts vanish with the dawn."